It was just in January that LG's 5-inch Optimus G Pro, the update to the Korean firm's flagship Optimus G, was confirmed for an April release in Japan, and already a better version appears to have sprouted. That is, if you consider the adage "bigger is better" to be a sound one - the most recent LG Optimus G Pro leak reveals a 5.5-inch screen, making it considerably larger than its little brother. 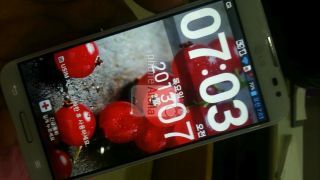 A photo of the plus-size Optimus G Pro appeared online Thursday, along with a tip sheet that spelled out its massive form and impressive specs. Rumor is the big LG Optimus G Pro could be one of those "breakthroughs" that LG has planned for Mobile World Congress at the end of the month. According to Phone Arena, which procured the image and specs for the 5.5-inch Optimus G Pro from an unnamed source, the larger handset's massive full HD IPS-LCD display comes in at a gorgeous 1080p. With a 1.7GHz quad-core Snapdragon processor, 2GB of memory, 13- and 2-megapixel cameras, NFC, LTE, and 32GB of storage with room for up to 64GB of microSD, this Optimus G Pro is no slouch. The battery reportedly comes in at 3,140, an upgrade from what the smaller 5-inch Optimus G Pro is packing. And don't forget about the Android 4.1: Jelly Bean out of the box. According to the image, the 5.5-inch Optimus G Pro also has a special port that combines HDMI and RGB outputs. TechRadar first caught wind of the 5.5-inch LG Optimus G Pro in January, but that rumor was quickly superseded by LG's unveiling of the 5-inch version. Watch out for an announcement at MWC in Barcelona this month. In the meantime, TechRadar asked LG to find out if the company would like to confirm any of these details. Unfortunately, spokesperson responded that the company doesn't comment on rumors or speculation, so it looks like we really will have to wait until MWC.